(Lowell) We are usually mired in the mundane of everyday, and we can’t see movement in our own internal characters. That’s why we tend to want some movement in the characters we see on stage. In a good play, a protagonist cannot be the same in the end as she was in the beginning; she must at least gain some scars from experience. The rare exception is a script that goes for the meditative study of a character, as if peeling back layers of a soul like an onion. To pull this off, the author must have deep sympathy for both the character and the human condition, and it’s a narrower road to tread. 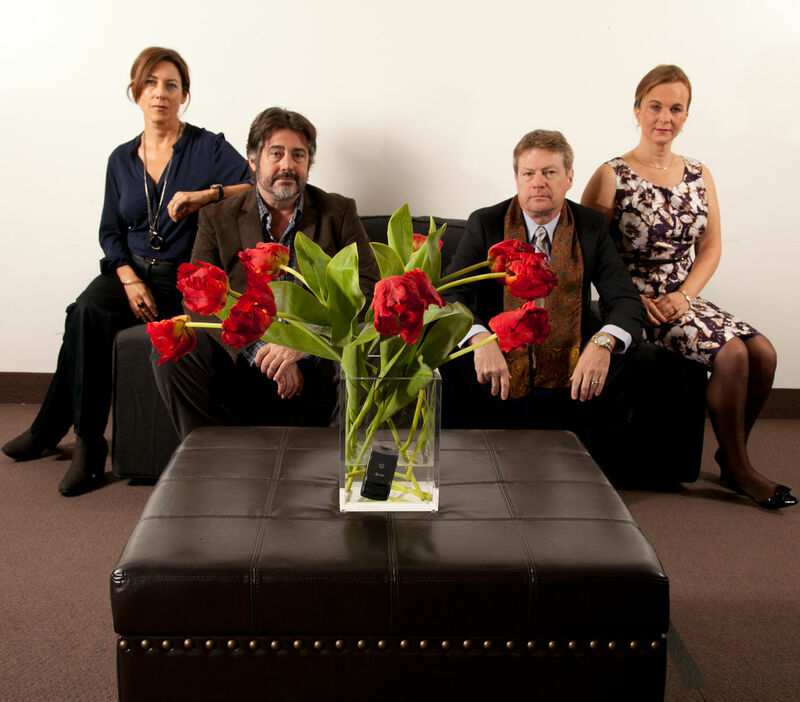 In the Merrmiack Repertory Theatre’s staging of God of Carnage, author Yasmina Reza and director Kyle Fabel seem to go for a third option, and the results are more like touching a third rail. The characters start out as hollow facades of humanity and spin their wheels for an hour and a half. Four well-to-do New Yorkers come together to discuss the ramifications of a brawl between their offspring, and they end up getting drunk, yelling at each other and smashing the gadgets that make them upscale. We’re supposed to get something out of this, but all I got was something akin to a hangover. It was like watching Jersey Shore masquerading as PBS. The cast is strong, especially Joseph Adams, who plays an amoral lawyer (Alan) who is the most honest of this bunch for his lack of humanity. But their efforts are frittered away, as Fabel directs them for parody instead of storytelling, which is the bread and butter of Merrimack. Fabel’s choice saps the cynical script of its feeble heartbeat, and the only thing left for this production to run on is energy. Luckily, this cast had a lot of that, and the set is something to behold. It still was not enough to keep me from checking my watch. But in my opinion I may be in the minority. The play has seen strong ticket sales and standing ovations, and I have been searching my brain for why. I think God of Carnage is not a story as much as catharsis. It’s a chance for any adult to revel in the naughty behavior they daydream about as they sit through yet another simpering board meeting or PTA social. I’m glad it serves at least some purpose. This entry was posted in Drama and tagged 2013, Christopher Hampton, God of Carnage, Jersey Shore, Joseph Adams, Kyle Fabel, Lowell, MA, Merrimack Repertory Theatre, New York, October, PBS, PTA, September, Yasmina Reza by craigidlebrook. Bookmark the permalink.